The F.X. Matt Brewing Company in Utica, NY is a legend in American brewing. The Matt family’s involvement in the business dates from 1888 although brewing had occurred onsite earlier under different guises. At one time, thousands of small breweries dotted the country. Matt’s is one of the very few to survive the industry’s consolidation after WW II and successfully transition to the craft beer era. Its continued family ownership is one reason. 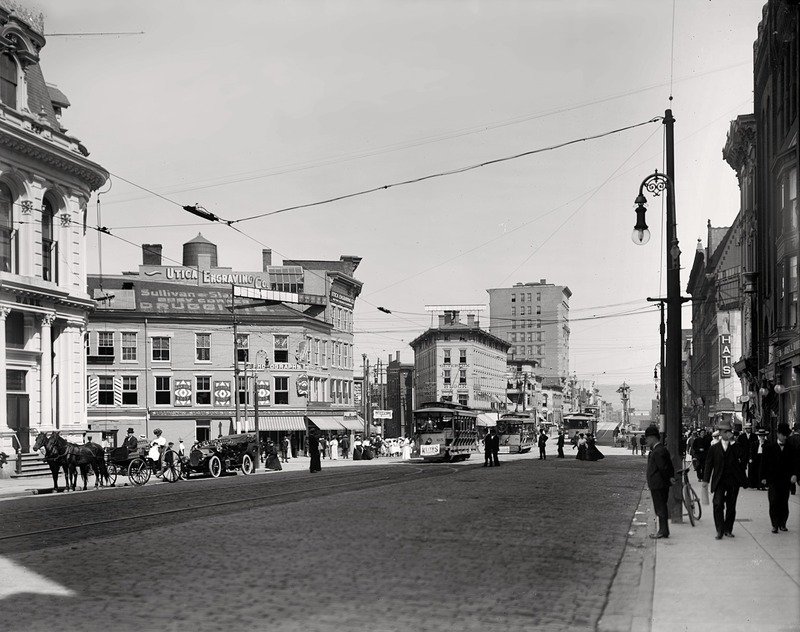 Another is that while by mid-20th century the family was committed to mass market-style brews (Utica Pilsener, Utica Club Cream Ale), it never forgot what the roots of real beer were. Not long after craft brewing revived in the early 1980s, Matt’s got involved in the scene. It did this initially by brewing beers under contract for entrepreneurs without a bricks and mortar facility. Matt’s brewed for Matthew Reich and to this day makes a chunk of the beer sold by famed Brooklyn Brewing Company (Steve Hindy, Garrett Oliver). Matt’s introduced as well its Saranac line, beers made in traditional styles, most all-malt, which reached back to the origins of American brewing. The first Matt in the business was from Baden in Germany. Partly because he lived so long, to 99, authenticity was always in the mind of the company. The arrival of craft beer therefore provided a natural opportunity rather than a puzzling challenge. For too many small outfits across the country, beer was simply adjunct lager, lightly hopped, pasteurized in can or bottle, difficult to differentiate from 1000 beers in the country. In the post-war climate, success was determined by innovative advertising, production and other efficiencies, and distribution savvy. The inherent quality of the product became a bloodless “QC” matter, in and of itself salutary, but for most American breweries by the 1970s, real beer was a dim memory if it was understood at all. Matt’s was unique in holding on to parts of its heritage and understanding that the market was slowly changing. Small is beautiful was becoming a new mantra. The famous 1960s Volkswagen ads are an example, but there were many others. The Utica Club 50 Years campaign was a parallel example of the greening of business so to speak, a trend now taken for granted internationally. Here is an example of the innovative 50 Years campaign, from the Herald-Mail in Fairport, NY, July 23, 1963. In 1970, DDB’s David Reider explained the genesis of the 50 Years Behind The Time campaign. 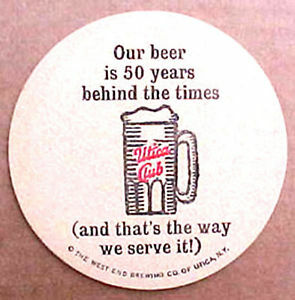 The slogan initially headlined a display of the Pilsener on a vintage beer tray. 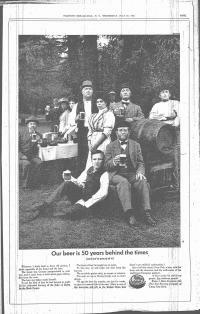 Later, it was adapted for a series of print ads showing black and white photos from c. 1910 with men holding beers in saloons, at picnics, and in other settings. The period dress, moustaches, and old beer mugs suggested old-fashioned values, authenticity. As for the beer itself, the ads stated it was aged a few months, not a few weeks as most current beer, and wasn’t artificially carbonated. The ads pointed out that this older way of brewing required extra space and equipment but was retained because it made for better beer. Yet in other ways, the qualities vaunted for the Pilsener were really quite modern. The ads stated guilelessly the beer was not “bitter” (or sometimes, not too sweet, not too bitter). They freely mentioned non-malt brewing grains as an ingredient, in effect placing it on a par with barley malt by explaining that no sugars or syrups were used. Some old photos pictured dark beers, but the ads skipped lightly over this, saying simply today the beer is light. While it is tempting to regard the campaign as a savvy attempt to make something new look old, that would be too facile. Tradition really did mean something to Matt, but the concern manifested itself in different ways in different times. The proof again is the onset of the craft beer era: Matt’s got it, when most of its competitors didn’t. Walter Matt was the executive who approved DDB’s work and was the son of the long-lived first Matt. Father and son obviously knew and never forgot what traditional brewing was. That concern was handed down to the Matts who have run the business since. So when we look at what really ensured the success of the company, it wasn’t just business savvy, it wasn’t gimmicks, it was the respect for traditional brewing. Utica Club Pilsener is still made by the company. It’s a relatively small part of production now, but adjunct lager is itself now part of tradition, so it has been retained, and rightly so. A product of its era I liked, Maximus Super, is no longer made (I believe), and should be restored. Michael Jackson had good things to say about it in his first beer book (1977). It was a tasty, high octane beer, a twist on that uniquely American category, “malt liquor”. I visited Matt’s twice in the last 30 years and would recommend it to any beer fan. The brewery is a handsome Victorian survival in a town nestled in the Empire State’s green Mohawk Valley. If you want a sense of what the brewery and town were like at the dawn of the craft beer renaissance, read it here in Stephen Morris’ matchless The Great Beer Trek (1984). Note re images: The images above are respectively from an ebay listing, from the 1963 press story linked, and from Wikipedia’s entry on Utica, NY. They are believed available for educational and historical purposes. All trade marks or other intellectual property shown belong solely to their lawful owners or authorized licensees. All feedback welcomed.